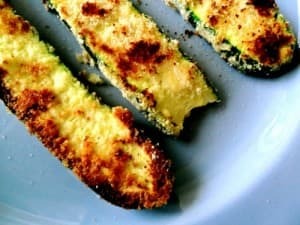 My memories of breaded zucchini date back to the late 80s and early 90’s, when I would enjoy the fried version with a batch of marinara sauce at Denny’s or some other large chain restaurant. I’m a big fan of zucchini – roasted, sauteed, in soups and stews, but I haven’t thought about breaded zucchini in well over a decade. Once I snubbed my nose at fried foods it disappeared from my memory banks. I’m excited to have the crunchy and the zucchini goodness back on my menu again with this recipe. Now that my tastes have expanded, I also see this pairing well with BBQ sauce, Honey mustard, as a french fry substitute sprinkled with quality vinegar. I love healthy versions of winter comfort food! 1) Mix water with flax seed and set aside for about 5 minutes to gel. Alternatively, beat egg until thoroughly mixed. 2) For fries, slice zucchini into ~3″ long fry spears (i.e., about the length of normal fries, but about double the thickness). For breaded zucchini, just slice into long, flat strips. Follow directions the same unless noted. 3) In a deep plate, add about 1/4 C almond flour, and generously mix in salt. 4) Once flax has gelled some, dip or roll zucchini in the flax “egg”. 5) Roll each individual fry in almond flour breading mixture to coat. Set aside. 6) Add more flour/salt mix to plate and make more flax egg as needed until all zucchini is used. 7) Place on greased, flat baking sheet, and cook in oven at 400 degrees F, flipping carefully after the first side browns. (Keep a close eye on these — they can burn fairly quickly.) For breaded zucchini, simply fry them in some coconut oil on the stove, flipping once browned on one side.